Are you a ‘Fabpreneur’ or an ‘Olderpreneur’? I was chatting to Prime (the Prince’s Initiative for Mature Enterprise) today, and we were talking about the energy and maturity women over 50 are able to bring to setting up a business. It wasn’t long before we turned the discussion to perceptions of age, and how 50 is far from old. Why then are people setting up businesses in their fifties (or sixties) referred to as ‘olderpreneurs’ and not just entrepreneurs with a bit of maturity thrown in! What does Olderpreneur mean to you? What does the label ‘olderpreneur’ conjure up for you? For me anything starting with ‘old’ seems a little negative, especially when you consider the energy and commitment required to set up a business. If we want to change perceptions of the boomer generation then we have to stop thinking of 50plus as being old! If we live to be 100 ( as 20% of us may well do) we have not yet lived half our adult life. 50 years is far too long to wear the ‘old’ label! So what name, other than the perfectly acceptable ‘entrepreneur’ would a 50+ female entrepreneur like to be known as? My vote is ‘Fabpreneur’. 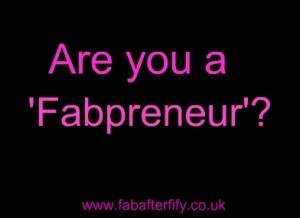 Would love to know your thoughts- and if you know any inspirational ‘Fabpreneurs’ we should feature on Fabafterfifty then please let me know! Oh Ceri, don’t get me started or I might not be able to stop! Like you, I really don’t like the term AT ALL. I won’t go into rant mode here but I did write about this very same subject on my blog a while ago! Karen, it amazes and frustrates me that once we hit 50 we attract the label of ‘old’ – we need to keep working hard to change perceptions! ‘Olderpreneur’. Eeek what a horrible term and one I’ve not heard before. Im sure our members wouldnt find it funny at all as we have many over 50. Many more over 50 than under 30 actually, and they are all dynamic and exciting women. We have a discussion running on our site about the term Mumpreneur and that has REALLY kicked off a fiery debate! I just dont get this need to marginalise yourself any more than necessary with trendy terms or names. Talking about ‘Fabpreneur’ though, I met someone once whose actual job title was ‘Head of Fabulous’. Never did work out what she actually did. How about ‘Primepreneur’, as we are in our prime with, in some cases, still a third of our working lives to live, but with skills and experience that younger people haven’t yet achieved. It seems that in these ageist times, self employment is the only way back into employment for many of us. It also pays homage to PRIME, of course – the only other organisation that seems to be doing something to help those of us in this age bracket who have lost our careers in this dreadful economic time. There has been much discussion in the media about 18-24 year olds who can’t find a job – and I feel desperately sorry for them – but there is still a generation of over 50’s out there who are losing their homes as well as their careers and who generally feel worthless and unwanted. Well done to organisations like yours and PRIME for doing something positive to help them. Gaum,thank you for commenting on this. I am a great advocate of Prime and the work they do (in fact PRIME have invited me to be a speaker at their next London event). I have a 25 yer career as an international headhunter behind me, and have experience of setting up businesses- the most recent being in my 50 s and am happy to share what I have learned in the process. I believe all of us over 50 have a valuable contribution to make, both as employees and ‘fab’ or ‘prime’ preneurs and am passionate about getting that message across! Ouch! Olderpreneur… what a dreadful term…. I quite like the suggestions above and also maturepreneur. 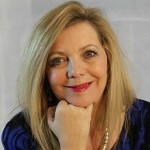 I have started my own business in my 50’s alongside a part time salary’d job after being made redundant. About to be made redundant again (short term contracts in local gov and third sector) so at least have my own business to fall back on if all else fails! Its a far cry from what I’m used to ( I set up an eco cleaning business trageting families with children who want to reduce allergies etc) there’s life in the old girl yet and I feel that us women in their 50’s have so much to offer. What I’d really ilke to do is help the younger generation that are currently NEET (not in employment, education or training) to set up their own business like I have as what I have done cost very little and yet produces an income and helps the planet too! Good luck with your business venture Jo. It just goes to show how resilient and determined we women over 50 are! PRIMze have some excellent resources and host events throughout the U K. In fact I have been asked to speak at one of their London events in March. Working with NETs sounds a great idea. Good luck, and keep us posted! Last year, at the age of 59 I embarked on my own business – Short Walks in Auckland. I taught myself website building, and created products. This year I am embarking on writing a series of guide books. This new adventure is a lot of fun. I have started to create my own line of Benjarong porcelain ;a Thai traditional form of multicolored hand-painted enamels on Fine Bone China. It all started from a passion from the old Benjarong collectible pieces that I own. I have challenged myself in creating a different line with relevant and interesting designs, suitable for everyday use and adapted to the modern taste. I am looking forward to Fabpreneur soon ! I am emphatically NOT an “Oldpreneur”! I am finally coming into my own, having discovered a career I feel I was always meant to do. Emptying the nest and staying fit, healthy and curious opens the heart and mind to so many new possibilities. So I object to any term that tries to put me in a box! 10 perceptions of women over 50 I would like to see changed in 2013.